Transstroi is asking for 4.9 billion rubles ($80m) from the construction committee of Saint Petersburg, following unilateral termination of the company’s contract for Zenit Arena. In July Transstroi was unexpectedly sacked as general contractor of Zenit Arena. The decision has put Transstroi in extremely difficult position, on the brink of bankruptcy. In fact, the next bankruptcy hearing is set for December 8 after local court already stopped one attempt to dismantle the company. 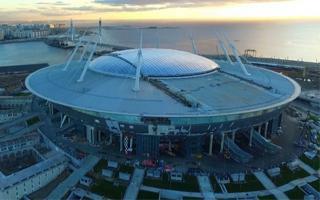 Transstroi blames the construction commission of Saint Petersburg for these issues, after the committee terminated the stadium contract just a few months before planned delivery. The governor accused Transstroi of numerous delays and irregularities in stadium financing, assuring that public authorities will demand compensation. Now Transstroi presented their claims and they’re massive. The company seeks to get RUB 4.9 billion ($ 80 million) from taxpayers. 935 million is expected to cover the unpaid construction work already done on site, further 1.7 billion would cover Transstroi’s losses resulting from contract termination and finally 2.1 billion is the penalty fee estimated by the company for unlawful contract termination. While it seems we’re ahead of multi-year court battle regarding the stadium, Zenit Arena has more other pressing issues. Even with new contractor Metrostroi’s employment increase from 4,000 to 6,000 people, the project is already certain to miss the December 2016 delivery deadline. Criticised as unrealistic for a few months now, the delivery date is now changed to March, 2017. That leaves less than 3 months for testing ahead of the 2017 Confederation Cup. While there’s no threat of the stadium missing out on its 2018 World Cup role, this may be a world record in construction delays. Zenit Arena was initially set for completion in 2009!